This is a quick dressing that is made from just three ingredients. 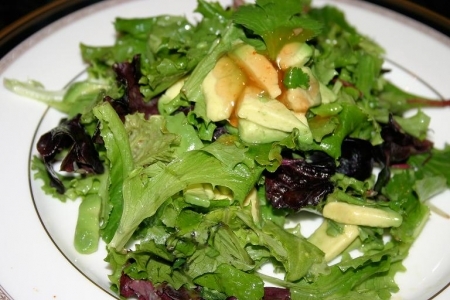 Toss mixed greens and avocado right before serving. Makes about 4 meal salads or 8 small dinner salads. Refer to How to Cut an Avocado technique if needed. Rinse and drain mixed greens. Pat dry if needed so dressing will stick to the greens. In a medium mixing bowl, whisk together the juice from the tangerines, sweet chili paste and rice wine vinegar and set aside. When ready to serve, dice avocado and set aside. In a large bowl add mixed greens and a sprinkle of kosher salt. Toss with dressing until evenly coated. Dvenly divide among plates and top with diced avocado. Serve immediately so avocado doesn’t turn brown.